Is it the right time to restructure your portfolio? The stock markets are at an all-time high, so is it the right time to restructure your portfolio of investments? The stock markets are at an all-time high, so is it the right time to restructure your portfolio of investments? If major part of your investments consists of equities and equity-oriented mutual funds, then the answer is definitely: ‘Yes, it is time to book profits’. So, you should exit stocks that have risen sharply, way above your purchase price, and redeem the mutual fund units whose NAVs have soared over the last two years. After all, profits are meant to be taken home. You can now enjoy the fruits of your patience, perseverance and sagacity. A peak market would also help you to get rid of dud stocks that have been lying idle for many years in your portfolio. These junk stocks have hampered the growth of your portfolio and kept you capital locked-in with no returns, so if you can just sell-off these junks, your portfolio will emerge cleaner, leaner and healthier. After having divested a major part of equity investments and equity-oriented mutual fund investments, you would also want to reinvest part of the proceeds in fresh investments. This would be similar to restructuring your portfolio. Such restructuring needs to be done based on your risk appetite, financial goals, investment horizon and investment objectives. For this, you need to first define your asset allocation taking into account your age, income, expenses, assets, liabilities, etc. 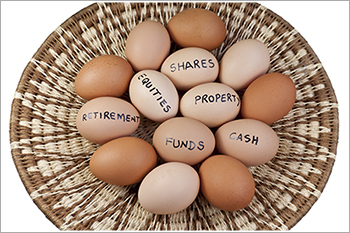 Once you have decided on your asset allocation, financial goals and risk appetite in keeping with your age, income, expenses and liabilities, you can proceed to build a new portfolio that meets your needs and financial goals.